Please do not share the link to the page or the videos with anyone who is not taking the course. 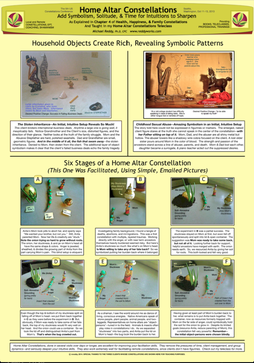 Click here to download a PDF of the the portions of the book that pertain to Home Altar Constellations. Click here to go to the information on how to get the certificate. These are the visuals shown live in the class and in the video. 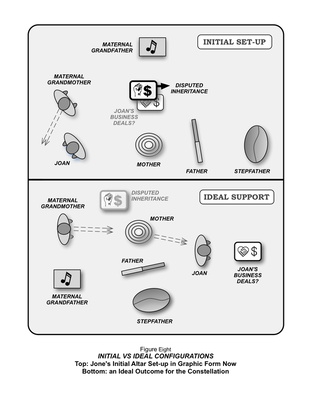 Click here to download a PDF with all images. The first four sections of Chapter Four, pp. 84-95 (only 11 pages). 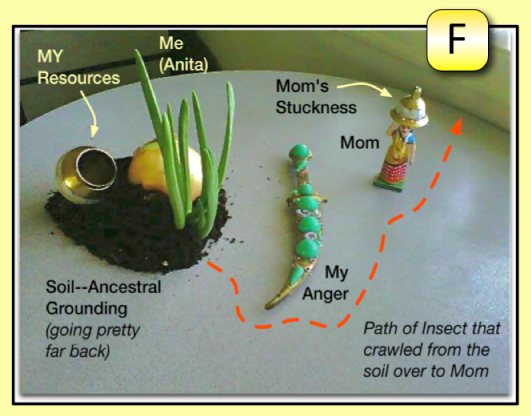 Assimilate the instructions in the readings for selecting and cleansing a home altar, get going on this part, and note any questions or comments you might want to bring to Facebook or the class discussion. Get into the Facebook group please. Bring questions or comments up there right away, or email me. 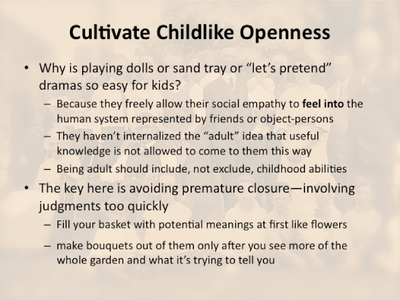 Some of these I may discuss in the next class as well. Start figuring out what you want to work on (I call this your "desired positive change"), using the tips found on pp. 91-95 and in the blog "Solution Focus Solves the Problem." You may do more than one constellation during this class, or only one... depends... Since you will have support from me and from the group, it's OK to go for the deeper kinds of changes here. Answer the study questions below, required if you want a certificate of completion from ReddyWorks. 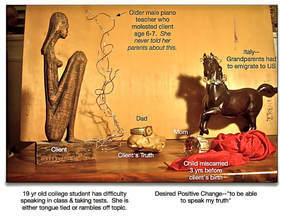 If you are doing this class over again, then you might have your altar set up and cleansed, and a Desired Positive Change (DPC) pretty well selected and stated by next class. 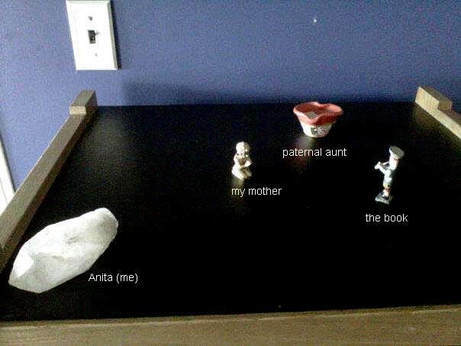 If you already know how, take a picture of your still empty or initially setup altar with your smart phone, and post it on Facebook. This is just practice for taking pictures of your altar, so that you can get feedback on it from me and/or the group. You'll get instructions on how to do the pictures in the next class. Move on further ahead if you like by reading pp. 31-38, and 62-65, going further with your "Intake Interview" of yourself pp. 91-95, or getting started with Selecting, Setting Up, and Visiting (pp. 95-98). Keep in touch with me on our Facebook group with comments or questions. I'll be watching it every day. Contrast the worldview most of us grew up with in the Western world with indigenous, animistic, "panpsychic" worldview of shamanism. What are the most common forms of communication used by all the forms of consciousness on this Earth plane to communicate with you? Why is a grace before meals an important part of learning to communicate with the living, conscious, enchanted world that will surround you if you care to shift your deeper belief system? What would indicate to you that adopting this different vision of reality is something you should put energy into? 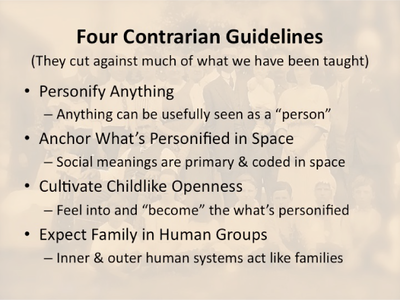 In what way do all of Michael's "four contrarian guidelines" relate to very early childhood perceptions? 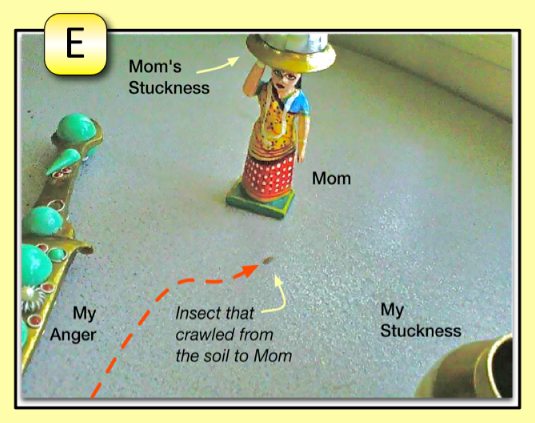 These are the visuals shown live in the class and in the video. Click here to download a PDF with all images. permit. 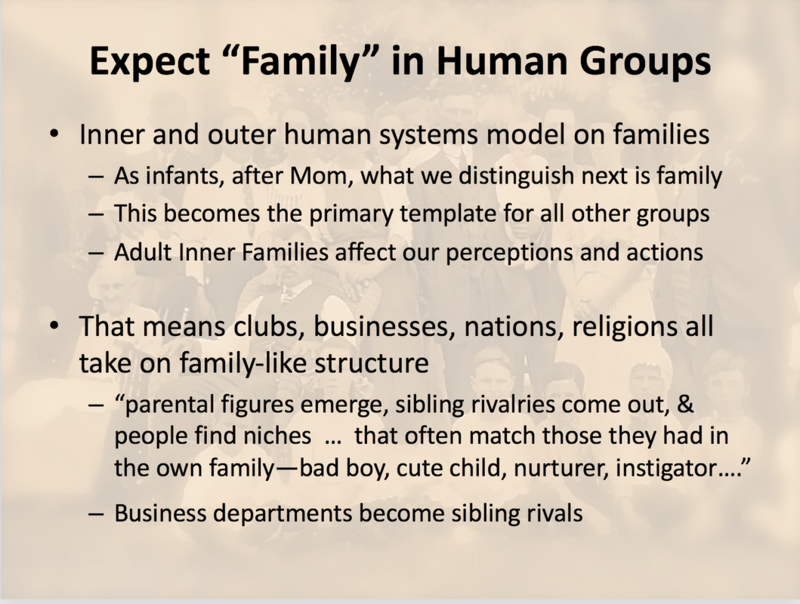 The "homework" I give you shows the pace that our focus will shift from one aspect to another. So it represents a middle ground. Take next steps in your constellation, and get clear about how (or if) you want to have us look at posted pictures of your altar. 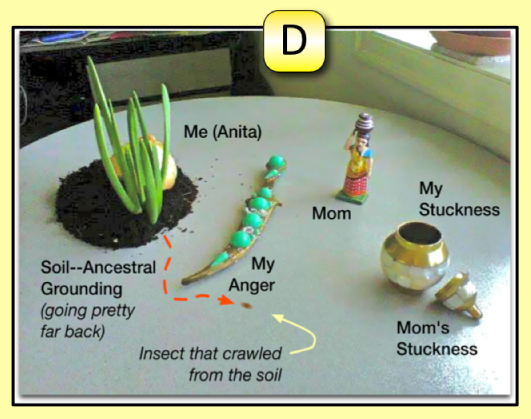 See the explanation of how to take and label altar pictures just below the study questions. Before you read pp 100-105 (if you haven't already), look at the sample altar picture on p. 102 (or better, use the color version posted above here on this page). You can start trying to interpret the symbolisms if you like. Try to stay close to what emerges looking at size, shape, what it is, what it's made of, position, orientation, what it does, etc. Then move go groupings, barriers, empty spaces in middle, etc. Go for as much richness as you can, being careful to keep you mind as open as possible. That is, don't let premature closure on some idea of what the dynamic is keep you from seeing the whole tapestry. Move on ahead--I'll leave that to you this time, since this is a big week in terms of things to do. Probably the biggest, what with getting the photography thing right. Remember, labelled pictures are valuable records for your work with clients. So this is a worthwhile skill to learn. Name 4 of the guidelines for selection and placement of your home altar. What kinds of questions can you ask yourself or your client to help focus a Desired Positive Change. Suppose someone says, "I need more abundance in my life." Formulate your answer by creating some questions around this initial statement. 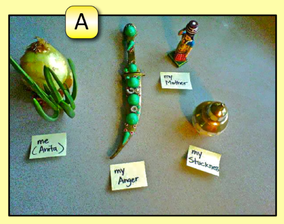 Explain the 3 guidelines for selecting object-persons to represent on a home altar. What are "wildcard" representatives and how do they work in home altar constellations? 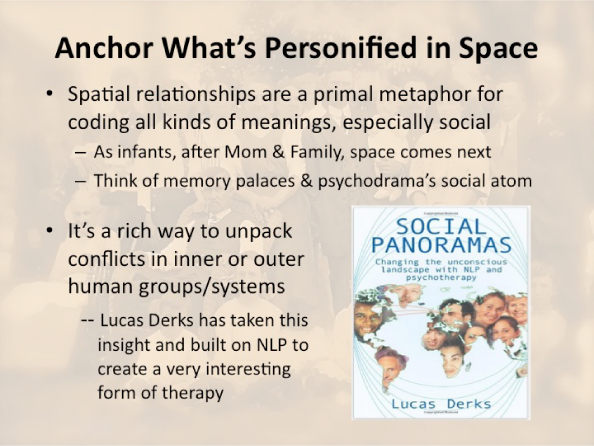 In your own words, as best you can, explain your understanding of what being "too mental" in the selection and setup of your constellation means. Maybe give an example or two. 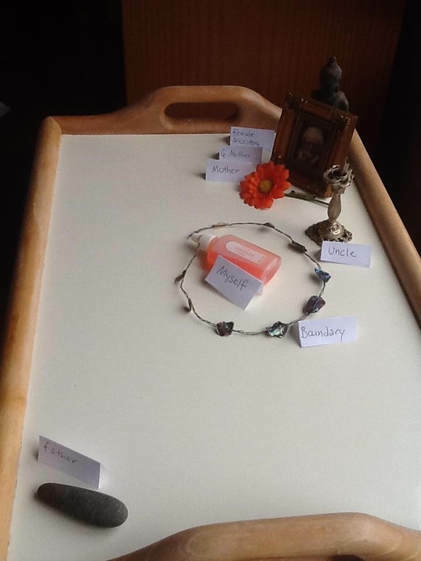 If you want to get feedback on your altar and its movements, you'll be taking pictures and posting them in the Private Secret Facebook, or else sending them directly to me. PLEASE help us all by labeling your pictures. Main thing is what represents who. I do not have time to translate your email descriptions of who is who, and we can't be do that in class either. Here's some tips on how to do this quickly and easily. Most smart phones and many tablets will take the pictures for you. and take the pictures preferably from about 45 degrees above the altar (not directly overhead, and not level with the altar). 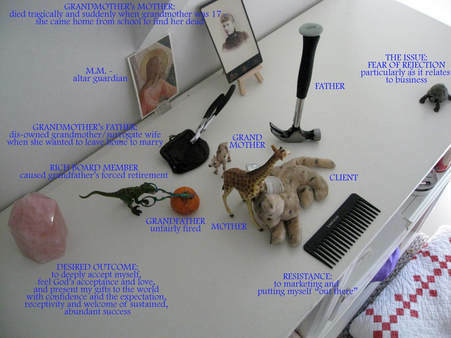 Mid Tech--take the picture, print it out on a full sized sheet of paper, write what the object-persons represent clearly and legibly on the paper, then scan (or re-photograph) the paper and make a JPG or GIF or PDF out of it and post or email that. Otherwise, get OVER, a very nice App that lets you do all we need from the App Store on your phone. Or download any of the many other photo editing apps that exist. Android Phone or tablets--Don't have one of these, but SCREEN MASTER, PHONTO, and SNAP MARKUP seem to be highly recommended. Once you've finished--post the labelled altar photo on Facebook, or email it to Sandy or me. Sync or email it to your own computer also if you want a record there. If you own PHOTOSHOP or OMNIGRAFFLE, or any higher end photo editor, of course, just use that. PREVIEW on Mac allows you to add captions--use the TOOLS>ANNOTATE>ADD TEXT option in the menus at the top. Reasonable light except back right corner is too dark, good angle in the vertical, labels perfectly sized but hard to make out. Might have used thicker marker, still we can work with this. Notice that the very white background of the altar can require more light on the object persons. ​Light and angle are fair, but labels obscure the reps and one word is invisible against the black background. The horizontal perspective would be better from an angle somewhat more to the right. However, the horizontal perspective chosen almost becomes part of the constellation here. The problem is paramount, and the DPC is less visible and distant. Vertical angle a bit high, labels readable, light good. But this tends to be what happens when there is an unfocused DPC--too many reps and not much clarity about where dynamics might lie. There is also too much information in the labels. This is back ground information we may need to talk about, but it doesn't all have to be in the altar picture. 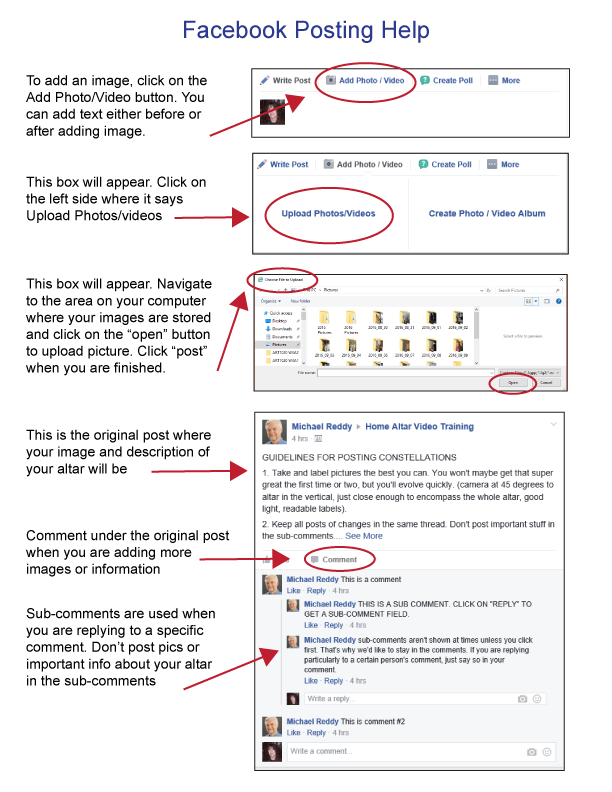 The following is some help for posting images and comments on Facebook. 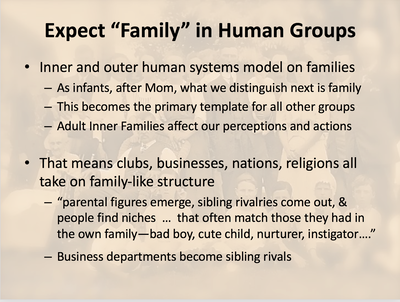 These are the visuals that will be shown in class. Click here to view a PDF with all images. 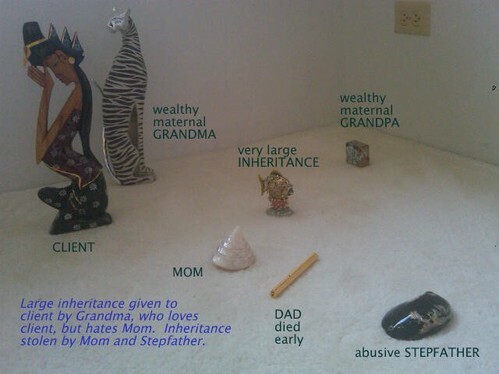 Compare our conversation in the 3nd class about the sample altar in the book Chapter 4 ("stolen inheritance") with what is written and with what you think yourself. 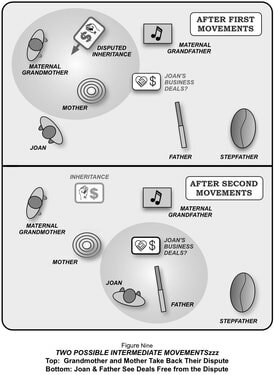 The picture here on this page above is in color and it's better to look at that than the one in the book (this is the "stolen inheritance" picture). Take the techniques named and explained in SEEKING A DYNAMIC and practice them yourself on the altar you have in progress. Use these to start moving it past the initial setup. Take pictures of each major stage if you are going to take part in that process. Bring up questions or comments in the Facebook group, or email me if you are not or if you want to be more private. Some of these will then come up in the next class as well. Practice this dual movement of analysis (where you stay very close to just the characteristics, and relationships, positions, orientations, postures, and groupings--the landing gear), and also intuitive interpretation in which meanings just jump out or where various of these many possible readings come together to make the more likely ones. 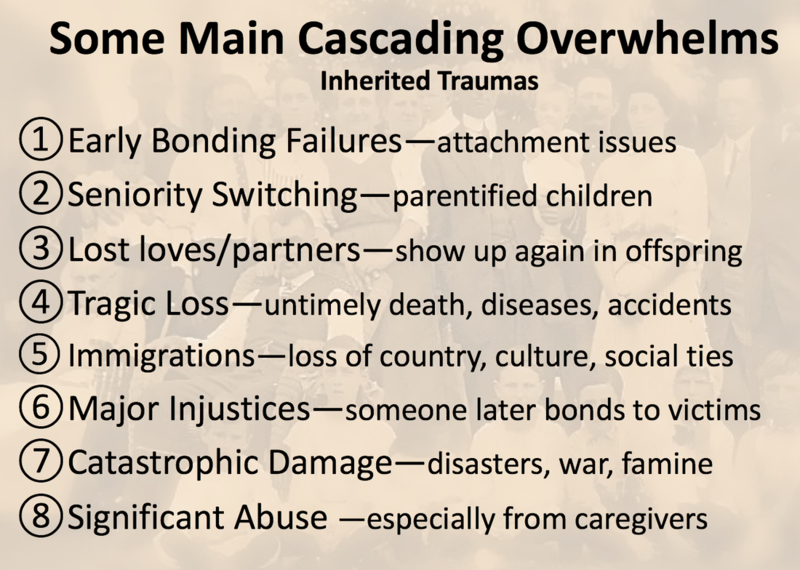 Explain "Seniority Switching," one of the 8 origins of family and ancestral trauma, and give an example. 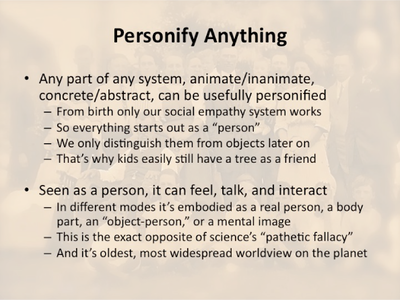 What is the first and primary guideline for unpacking the symbolism of object-persons? What is the relationship between intuition and analysis that Michael is suggesting you try to cultivate? If you see home altar object-persons grouped roughly around a middle space, what is often the significance of that middle space? 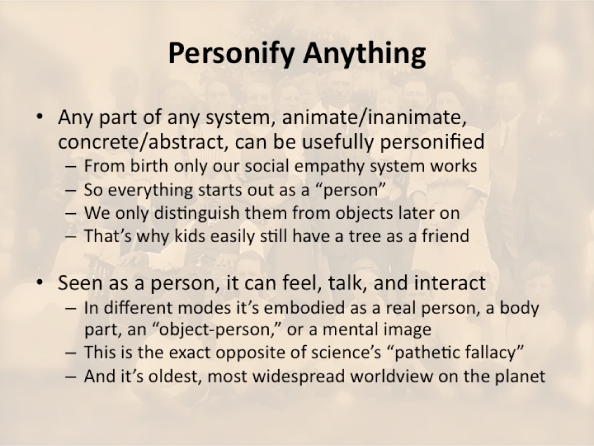 If there is no object-person currently in that middle space, what is a good experiment to try? 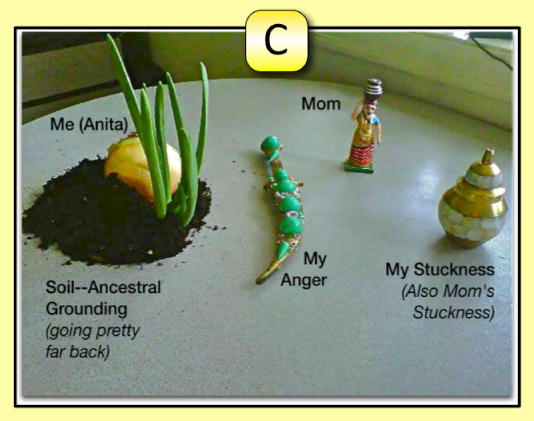 Consider these stages of a home altar constellation: intake, selection, set-up, and searching for a dynamic. In which two stages do you particularly want to avoid being "too mental"? These are the visuals shown in class. Click here to view a PDF with all images. 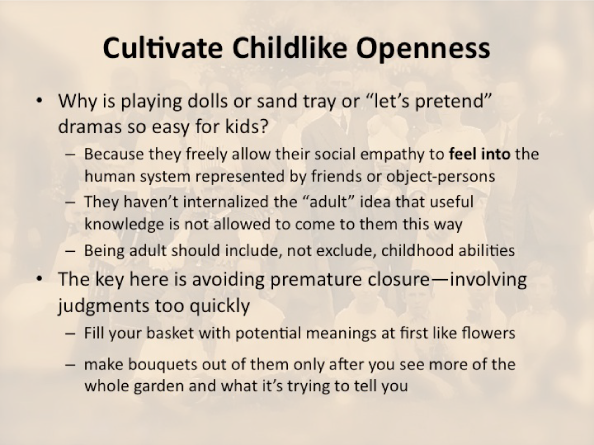 Three things, this time--read some more, practice the techniques from the reading (silence, check in's, repositionings, rep changes, tentative truth statements, and perspective shifts), AND KEEP THE WELL LABELLED PICTURES COMING ON FACEBOOK OR TO ME VIA EMAIL. It's from these that we will draw the material for discussion. Take the techniques named and explained in SEEKING A DYNAMIC and practice them yourself on the altar you have in progress. Recall the complementary, dynamic tension discussed yesterday between intuition and analysis. Get as much richness as possible into your interpretations. Bolster, expand, and train your intuition by simply "unpacking" the symbols on the altar--less attempt here to interpret, rather more notice patterns of shape, size, color, position, what it is, what it does, where it comes from, and any personal history it has. Feel free to bring ANY questions or comments up on Facebook right away, or email me. Some of these will then come up in the next class as well. KEEP THE FACEBOOK GROUP MOVING. IT HELPS ALOT. You can also email me pictures directly. 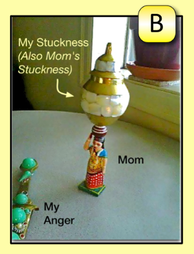 What is the general guideline for what to do when you are "checking in" with a rep on your altar. What does Michael mean by the "iterative approach"? What benefits does he think it provides? What is the "butterfly method"? 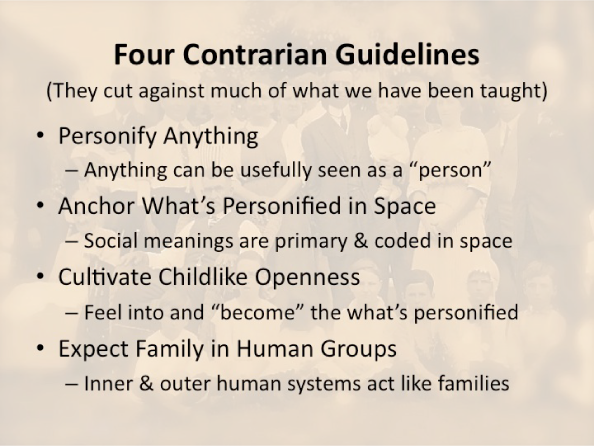 What are three advantages to using it both in workshops and altar constellations? Name and explain two of the techniques for seeking a resolution explained in the readings and yesterday's class. What are "tentative truth statements," and how do you best use them when a constellation dynamic is apparent but also seems very stuck? Same three things, again, basically: read some more, practice the techniques from the reading on the initial stages of your constellation, AND YES STILL GET AS MANY PICTURES POSTED OR SENT TO ME AS POSSIBLE. I have material from the participants for classes 5-7. There is still room for another person if we do a bonus class 8. Reread earlier parts if you have time, or want to deepen your understanding. Once again, take the techniques named and explained in MOVING TOWARDS RESOLUTIONS and practice them yourself on the altar you have in progress. Use these to start moving, if you are ready, towards some sort of resolution of your initial constellation. Remember the broad, rough shape of an effective constellation that brings change (not just explores): Expansion (branching) -----> a Dynamic (or confusion, or too many dynamics) ----> contraction (pruning) -----> focused resolution. Take pictures of each stage if you are going to take part in that process. Start another if you've finished the first one. If you are in the Facebook group, feel free to bring questions or comments up there right away, or email me. Some of these will then come up in the next class as well. 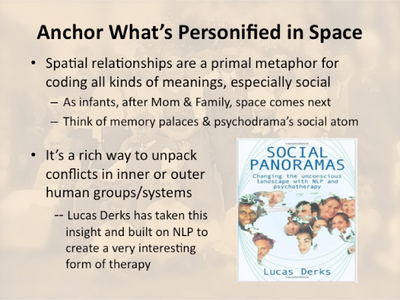 The dynamic in a constellation is the most obvious block or misalignment in the flow of life and love standing in the way of supporting the client's desired positive change. TRUE OR FALSE? If you see the representative for a child directly behind its parent facing the parent's back, the can often mean the child is somehow trying to parent the parent. TRUE OR FALSE? Constellations don't move spontaneously towards resolutions, so you always have to look for ways to help them. TRUE OR FALSE? Reread this article "Problem, Issue, Theme--or Solution?" (here), please, in which I detail and give examples of the DPC focusing process I've talked about in class. I just don't see people doing this process enough and would like you to look at it again. If you are in the Facebook group, feel free to bring ANY questions or comments up there right away, or email me. Some of these will then come up in the next class as well. 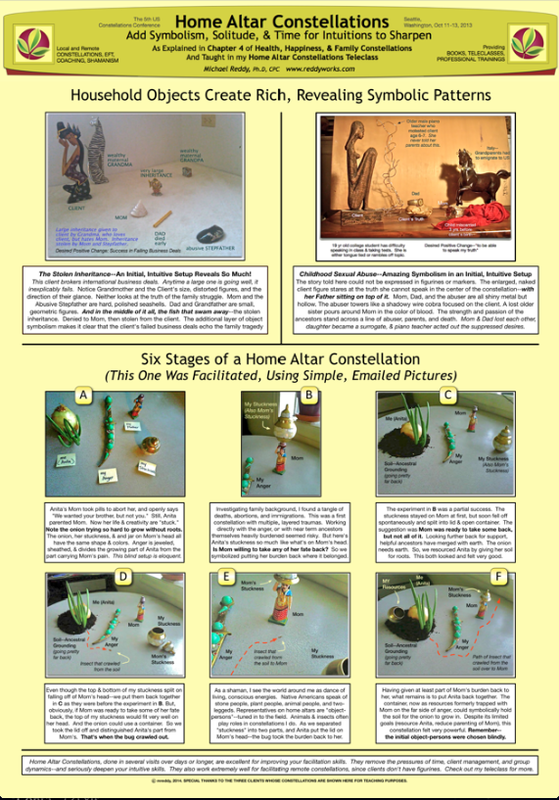 What are 3 things you should look back at if you do a home altar constellation and it just remains muddled--doesn't seem to mean anything very clear or move towards a better state. Name and describe three kinds of resolutions that Michael distinguishes. Give an example of a "nudge" during the probing for resolutions part of a constellation. Now turn that nudge into a fudge. 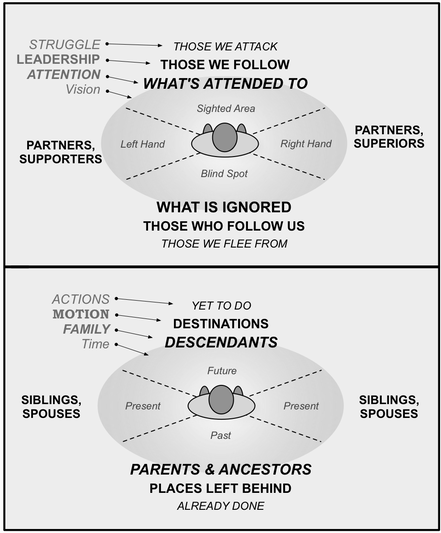 Explain what "visioning" and "comparing" mean as you come to see a dynamic in a constellation. In the "sequencing" step while probing for a resolution, what are the two levels you need to be looking at and taking into account? This poster will be shown in class. Click here to view a PDF of it. This is the altar we will be discussing in class. Click here to download a PDF with all pages. 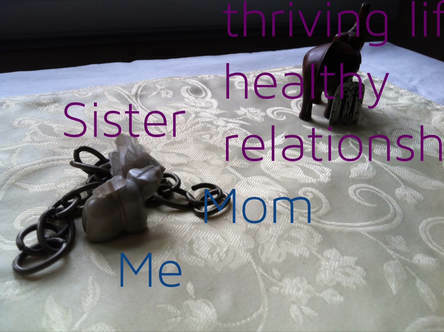 To obtain this, you must attend 5 of the 7 live sessions, do the readings, & complete the study questions for all sessions (sending to Sandy for verification). The answers will be e-mailed to you once Sandy receives them. What we need here is reasonable verification that you have dug into the material and are gaining an understanding of it. ​If you are someone who cannot make most or any of the classes, but still want a certificate, please contact me about an other way to verify that you have viewed all the classes and done the work. I'm open to arrangements but may charge a small fee for them depending.